There’s a moment before any swim practice, whether it’s a little kids’ summer league or the U.S. Olympic team, when every swimmer realizes it’s time to jump in—and the entire team begins stalling. We stretch. We chat with each other. We chat with our coach. What we do not do is get in the pool and swim, until someone all but pushes us in. Olympic swimmer Dara Torres has a chapter in her first book about this phenomenon, and I’ve seen it myself as both a coach and a swimmer. Now that the weather’s cooling down again, I’m seeing it in myself. Last winter, I bribed myself with Celestial Seasonings Sugar Cookie herbal tea. This year, I’m reverting to an older trick. Sugar Cookie tea tastes even better post-swim. 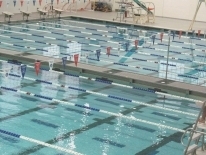 Whenever my high school swim coach, a lovely, kind, soft-spoken Russian man who looked a little bit like a thin version of Val Kilmer, saw us lingering on the pool deck, he’d call us out by name, and say, in heavily accented English: “Get in or get out!” We’d laugh at the idiom, and maybe roll our eyes at the instruction, and then … we’d get in. I’ve decided to make this my new poolside mantra, and tried it for the first time swimming at the newly reopened Takoma Aquatic Center yesterday. I lingered on the side of Takoma Aquatic Center's pool yesterday. The pool’s been closed for the past month for renovations. Apparently, those renovations included filling the pool with ice-cold water—like, 70 degrees—to test how serious I was about this new tough-love mantra. I felt the water. I squealed a little. I watched another swimmer dip her toes in the water, and then turn around and walk out the door without swimming. And then …. I got in. I’m not going to lie—it was legitimately cold the entire time, even when I interrupted a distance set to do some sprints to generate more body heat. But I got in. I swam a great workout. And then, I headed home and sipped some Sugar Cookie tea under a warm, fuzzy blanket, which is almost the same as seeking jammies and a cookie. I’m totally excited and motivated to get in the pool, because I found out there’s one not far from me that I had no idea about! Hooray!! Hahaha! This will forever be known as the “GO EAT A COOKIE” moment. 🙂 And, 70º? I would’ve left. Brrrr! “Get in or Get Out”. That’s a fabulous mantra. There’s something about water though, that changes how we feel about exercise. Our bodies crave warmth, and water (unless it’s a hot tub!) isn’t naturally warm unless we’re moving. So, we have to go from non-motion (standing on the deck talking) to immediate motion for the sake of warmth. Interesting! I never thought about it that way. I like your coach, and it’s a great mantra. 🙂 Happy Monday Amy!